Chakra Balancing is a fundamental factor in Ayurvedic Medicine, the ancient medical practice in India. It is believed that there are a variety of components that make up the human energy system. All aspects of the system are intimately connected to each other, and form a finely woven network of physical, mental, emotional and spiritual energies. With greater understanding of our subtle energies, we can see how our thoughts, emotions and physical body are interrelated. The activity of any one aspect ultimately affects the others. Thoughts influence emotions. Thoughts and emotions influence the spirit. Thoughts, emotions and the spirit energy are reflected in the health of your physical body. An imbalance in the body can drag us down, depressing the spirit, emotions and leading to negative thoughts. Unquestioned thoughts can bring uncontrolled emotions, affecting also the physical health. The connections go all ways. Chakras are centers of energy, located throughout the body; they provide a way for energy to enter and exit your body and help regulate all types of energy flows on all levels (physical, mental, emotional and spiritual). 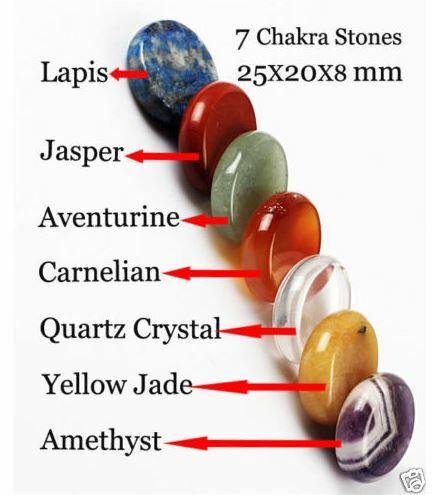 There are seven major chakras in the mid-line of the body. They run from the base of the spine to the top of the head. There are also chakras on the palms of the hands and the soles of the feet. Each chakra has a frequency of vibration, corresponding to sound, light and color (and emotion). The 'higher' the chakra, the higher the vibration, or frequency. Hence, the base chakra, located at the bottom of the spine has a lower frequency than the crown chakra, at the top of the head. By applying the adequate frequency to each chakra we can restore a balanced flow of energy. Chakras can be imagined like swirling vortexes of electromagnetic activity. Energy moves through them like through a funnel. Our chakras maintain a dynamic balance between receiving and building energy and releasing excess energy. Also, emotional imbalance, is viewed as a disruption of the flow of energy through the chakras and meridians. Similarly, in Energy Medicine, physical pain is thought to be caused by this disruption. The manipulation of chakras and meridians (acupressure/acupuncture) - can relieve pain and restore a balance energy system.